Sources have told NBC news that the shooting at the Mexico border near Naco, Ariz., that killed border patrol agent Nicolas Ivie and wounded two others involved friendly fire. NBC's Mark Potter reports. Investigators say that the Border Patrol shooting that left one agent dead was likely the result of three agents all responding separately to a tripped sensor on the U.S.-Mexico border, and unknowingly shooting at one another in the dark, according to several reports. The reports offer more detail on how Tuesday's incident unfolded. Agent Nicholas J. Ivie, 33, was killed and a second agent was wounded in a rugged area known for drug and human smuggling. 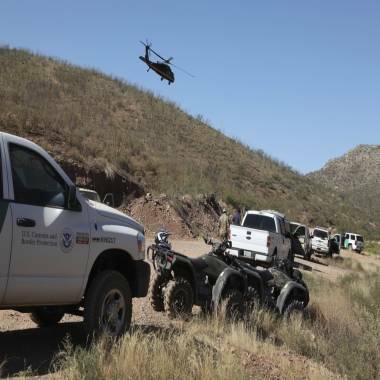 According to Cochise County acting Sheriff Rod Rothrock, the three agents were patrolling on horseback along several miles of the U.S.-Mexico border when all responded to the tripped sensor. George McCubbin, president of the National Border Patrol Council, a union representing agents, said all three agents fired their weapons. McCubbin told The Arizona Republic that the agents had split up as they investigated the sensor alarm. In the darkness between 1 and 2 a.m., the three converged from different directions into a saddle in the hills where the brush is relatively thick, Saturday’s Los Angeles Times reported, citing McCubbin. Law enforcement forces gather at a command post in the desert near Naco, Ariz. Tuesday after a border patrol agent was shot to death near the U.S.-Mexico line. The agents had been in communication earlier, and were aware of each other’s presence in the area, according to Rothrock. It was not clear why they didn’t talk when converging on the target area. McCubbin told the Times, "Maybe they tried to reach each other but couldn’t. They have lots of dead spots in the desert." Ivie was about 20 yards away from the other two agents when they apparently spotted each other, and started trading fire. Ivie "interpreted defensive postures from the other as aggressive postures," Rothrock said. 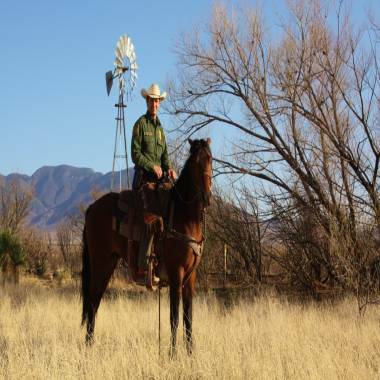 Border Patrol Agent Nicholas Ivie, who was was shot and killed in a rugged border area on Tuesday, in an undated photo. In the exchange of fire, Ivie was killed, and a second agent whose name has not been released was shot in the buttocks and the ankle. He was treated and is reportedly recovering at home. A third agent, who also remains unnamed, was unharmed. A high-powered rifle and a handgun were found near the shooting scene, the Times reported, citing government documents. It was not clear whether they were connected to the incident. State and federal officials initially said that the shootings were committed by armed criminals.